You have to feel for my big pal Jaggy. There he was at the Border Counties Rally, spectating. But this was before he ventured out to Kielder. He was stood transfixed inside Rally HQ in the Town Hall in Jedburgh. What had arrested his attention was the glass catering oven where rally Signing-On was taking place. This was the property of the Juicy Meat Company of Kelso who were providing heart warming sustenance to those about to embark on a wet and wintry outdoors. 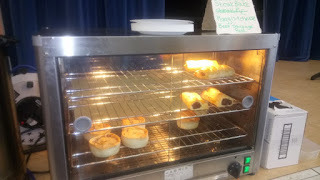 Placed tantalisingly inside the glass fronted warming oven were a range of Scotch Pies, Sausage Rolls, Steak Bakes and Haggis savouries. None of your lifeless Greggs stodge here. The deep golden pastry looked light and flaky and the meat sizzled in succulent silence behind the glass. The free range lamb and pork comes from the Dalgliesh family's own farm and they have access to local grass fed Aberdeen Angus beef from a neighbour. Naturally the captivated big lad was challenged by Moira Dalgliesh herself: "Is there something you would like sir?" "Aye, but ah'm no allowed," came the trucculent response, "The wife won't let me eat pies or pastry. Ah'm allowed tae spectate though. Mah weekly treat is a visit to a Greggs or a baker's, but I just stand on the pavement outside the window and spectate. Bakery products are purely for visual entertainment these days." So there the poor chap stood, beguiled by the sight and smell of some of Scotland's finest cuisine, but he did learn one little secret. Tomato sauce is used as an ingredient in the minced meat. Doesn't that just make you slevver, eh? You might want to check them out. The Juicy Meat Co also provide outside/inside catering for functions with spit roasts, and whilst that might be a temptation in its own right, the big chap was still there when I left, fair bursting to resist the temptation to buy a pie. I wonder if he succumbed?